As summer ends and autumn starts to bring colder weather, trees begin to get numerous visitors looking for shelter. Some visitors are harmless and leave when spring emerges; however, some never leave and will feed on your tree until it is destroyed. How Do Borers Hurt My Tree? Borers kill trees from the inside out. They do this by feeding on the vascular tissue, which reduces the tree’s ability to transfer energy and nutrients. In late summer, adult borers lay eggs on the bark of trees. When these eggs hatch they enter the tree through the bark and feed on its tissue all winter long. 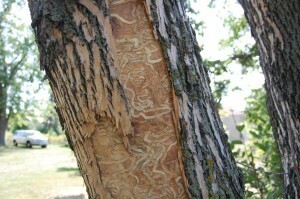 Once spring arrives borer larvae mature into adults, exit the tree, and start the process all over again. 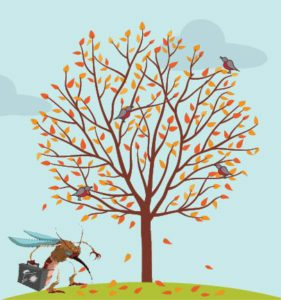 Since it can be hard to get borers to leave a tree the best plan of action is a preventative one. Why Is This Time Of Year Important? At this time of year, borers are looking for susceptible trees to enter and spend their winter in. By making your tree unappealing to borers in late summer and early fall, borers will find other trees to enter and feed on which stops the borer infestation before it begins. It important to keep an eye out for symptoms of borers; however, if you wait until the signs of borers show up in the spring, the damage will have already occurred and gaining control of the borer will be more difficult. Our Arborists suggest using preventative treatments for susceptible trees. Need Help With Fall Borers? Borers typically target hardwoods such as oaks, maples, beech, and ash trees. However; the state of the tree is a more reliable signal of borer susceptibility than species. Trees facing environmental stressors such as extreme temperatures, drought, flooding, and soil compaction. How Do I Keep My Tree From Getting A Borer Infestation? The most important step to preventing borer infections is having a borer spray applied to your tree. However, borers are known as secondary invaders, so keeping your tree healthy overall can deter borer infestations. Your arborist may suggest overall health treatments such as tree pruning, a bio-stimulant treatment, and soil decompaction, as well as a borer spray to combat borers this Fall. Bio-Stimulant Treatment: Bio-stimulants are a combination of organic microbial inoculations that are injected into the critical root zone. They contain a natural blend of sugars, bacteria, humic acid, sea kelp extract and fungi that feed the soil and naturally fertilize the tree without the negative effects of over-fertilizing. This treatment will help fight borers by boosting your tree’s immune system. Soil Decompaction: Soil compaction is common in our area. Compaction limits the amount of oxygen and nutrients your tree absorbs from the soil. This weakens your tree and makes it more susceptible to secondary invaders such as borers. Decompacting your soil through Aeration will allow your tree’s roots to absorb adequate nutrients, oxygen, and water which will strengthen the tree overall. Tree Pruning: Regular pruning (every 3-5 years) will remove dead and diseased branches that put extra stress on the tree. Removing these decaying limbs will help the tree be less susceptible to fall borers.